Welcome! TosaChess is the website for the McKinley Elementary School Chess program - STATE CHAMPS 2018! McKinley Elementary REPEATS as state champs! McKinley Elementary once again took the Elementary School State Championship in 2019, keeping the cup for the 2nd year. The cup will be on display in the McKinley Library. Great job team! Sign up now for the IAC's Muskego Melee on Dec 1 by going to http://ia-chess.com and/or sign up for the WSCF's Nicolet High School tournament http://www.wisconsinscholasticchess.org on Dec 8! If in doubt, I'd recommend the Muskego tournament for more advanced players, and the Nicolet tournament for everyone! I'll be there to help during the morning of Dec 1, and the full day on Dec 8. See you there! We are having an online chess tournament for McKinley kids - Sunday 10/28 at 6:30pm on Chesskids - hope to see you there! Only spots for 16 kids! Registration happens right before the tournament - open at 6:15... click on PLAY then click on Fast Games and you'll see the McKinley tournament. Tournaments are recommended for anyone who has completed the ChessKids QUEEN level lessons (and understands the material) - or of course for anyone who has competed last year in tournaments. Tournaments are usually on SATURDAYS from now through March, culminating in the big state tournament at UW-Oshkosh in mid-March. Also, McKinley has our OWN tournament on March 2 this year! We will be asking for volunteers and baked goods as the time draws nearer, but we are locked into the calendar! The Wisconsin Scholastic Chess Federation (WSCF) started scholastic chess in Wisconsin and has been going strong since 2003, providing tournaments in schools all over Wisconsin. Mr. Seghers, head coach at McKinley, is a volunteer board member. The WSCF will be running most of the tournaments we will be going to. While the WSCF has tournaments just about EVERY Saturday, we like to play as a team where we can, so there are RECOMMENDED tournaments I like to suggest as a coach, so we can all play together as a team, in addition to our kids vying for individual accomplishments. The IAC also offers some tournaments throughout the year - these tend to be USCF-rated, so you may need a USCF rating to play in them- each tournament is different. Some offer both rated and non-rated play. Last year our McKinley kids won quite a few tournaments, starting with the Milwaukee Folk Fair tournament - this year being held on November 17 at State Fair! This is our first recommended tournament of this season. A couple parents asked about chess this Thursday the 25th - since there is another event there in the evening. CHESS IS ON as usual in the library this week - see you then! We need more parent volunteers to help during weekly class! No chess knowledge required. Please follow link below to help out! Thank you. Mark Seghers is an healthcare technology executive as a profession. 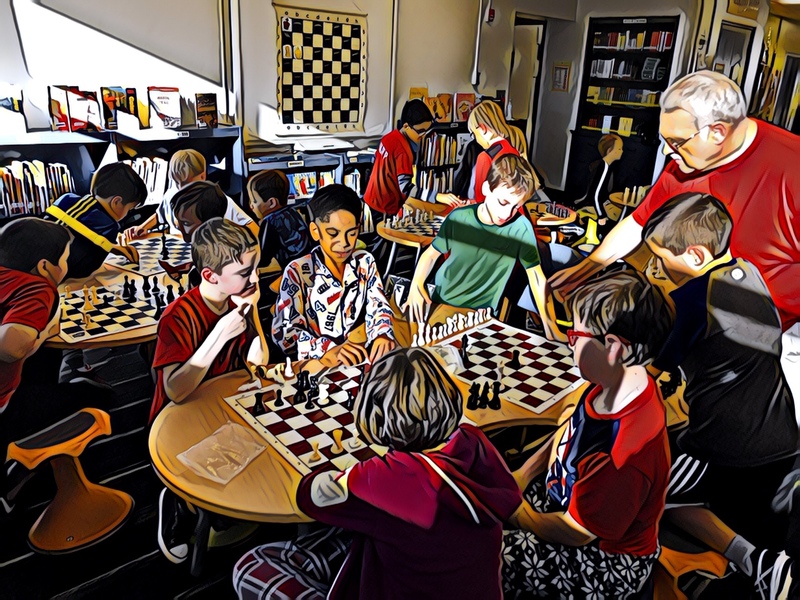 Mark is the leader of the McKinley Elementary Scholastic Chess Club, and prior to his move to Tosa, had been leader of the Muskego Scholastic Chess Club for the previous 8 years. Mark runs this blog.